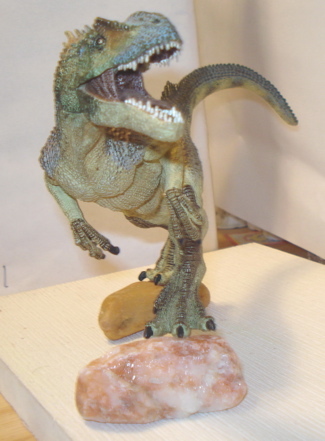 The PAPO Allosaurus has set a New Standard in Dinosaur Toys. 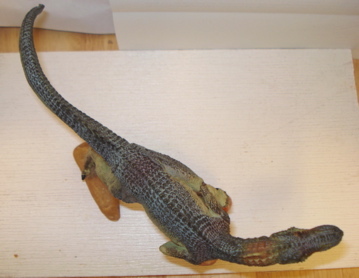 The Papo Allosaurus Has Set a New Standard for Dinosaur Toys. 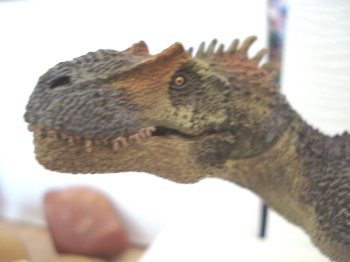 this Allosaur makes his, her and their presence felt. Your Allosaurus weighs in at a five and a three-quarter ounces (5.75 oz), measures almost eleven inches (11") from nose to tail tip and stands just over four inches (4.+") tall. Quite the 1/40th scale predator. His pose is very active with a full, very well balanced, stride. The arms are back and the beautiful head is thrust forward. A truly dynamic pose. and remains the ferocious Wolf of the Jurassic that he is. 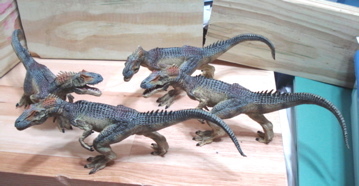 You want a PAPO Allosaurus of Your Very Own? Go Here to Find a Retailer Near You! 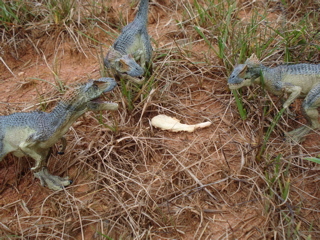 all work and no play makes for a hungry Allosaurus and here we find a trio leaving the MARX Buffet (Second Series). 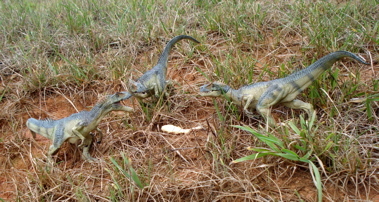 The Papo Allosaurus is, as clearly seen in the accompanying photos, highly and finely detailed. Every square millimeter of this figure is a work of art from the claws on the hands and toes to the teeth in its mouth. All handpainted by some very near-sighted Chinese citizen for the Papo Corporation this is the closest you will come to a true museum quality toy dinosaur at a reasonable price. 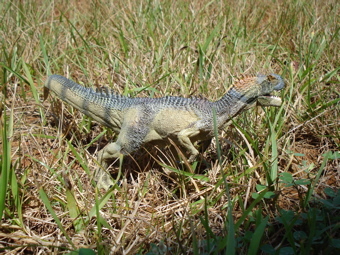 In addition to being very well balanced, extremely detailed and naturally colored the Papo Allosaurus has two additional qualities that make it a great Dinosaur toy. The first is the sculpt itself. 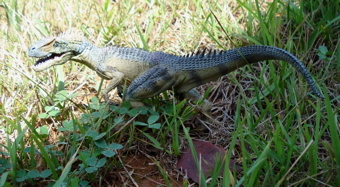 It is different from every Allosaur toy that has come before it in that it has 'spikes' on its spine, on its neck, shoulders and the base of its tail. This is a bit of an aesthetic reach but a very pleasing one and adds to the character of this plastic creature immeasurably. This is truly an artistic and unique take on an old wolf. The other is the "Papo jaw." Following the Raptor, T-Rex and Spinosaurus (all based on the Jurassic Park movie critters) the Allosaur's lower jaw can open or close at the master's (your) whim. 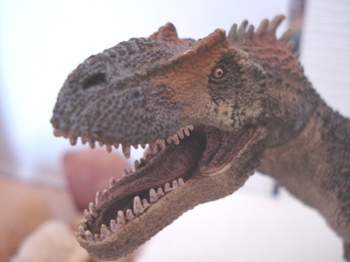 This adds a lot of personality to what is already one of the most dynamic Dinosaur toys ever made. He will go wherever you want him to and will stand pretty much wherever you place him. He also doesn't need batteries, has no mechanism(s) to break (apart from the very well made jaw) and is just a great toy. A true spark for the imagination. 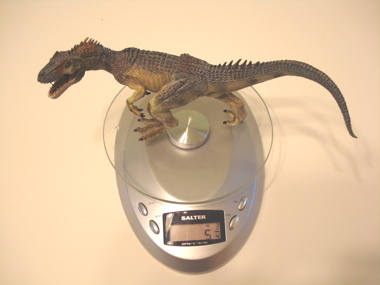 The Papo Allosaurus will also set you back about $20.00 so while you might not get many I strongly suggest you get at least two. They are definitely worth it! 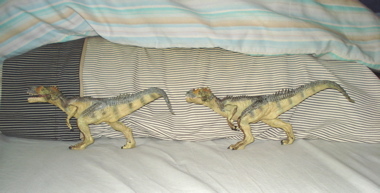 One of my top-five all-time-favorite Dinosaur Toys and my favorite Allosaur. This, and all the PAPO carnivores, MAY not be suitable for very small children due to the movement of the lower jaw. It could potentially be ripped off and swallowed or otherwise discarded. I have never tried to remove the piece but it is something to consider. 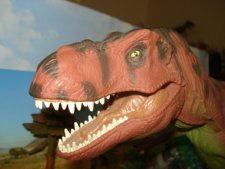 If you want this PAPO Allosaurus for your kiddo be aware of what he or she might have in mind for it. Know your child. That is all. 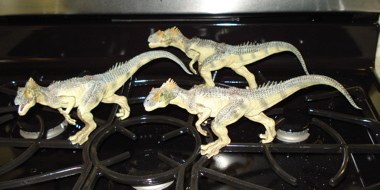 If you are interested in reading about the other Papo Dinosaur Toys click here!